The Dow Jones Industrial Average reached a record-breaking high yesterday, which according to the Wall Street Journal, means that we’ve finally overcome the huge losses caused by the Great Recession. While many are breathing a sigh of relief and are expressing a cautious optimism about the economy, it should be noted that the Dow is not the only measure that matters. The Daily Intel points out that it is just one of many indicators of the health of our economy– and most of the others are still looking bleak. This disparity is primarily due to the fact that politicians in Washington are more concerned with deficits than unemployment, and that federal, state and local governments have been cutting back on spending just at the time when it’s needed most. While large corporations are seeing their stock prices rise, small businesses are yet to benefit from the rallying stock market. Without an uptick in consumer demand, sales remain weak, and many small businesses still cannot access the capital they need to start up and expand. As both the Los Angeles Times and Politico report, unemployment has remained high because small businesses– key job creators– continue to face barriers. Demand for small business loans are up, but accessing these loans is still difficult. In sum, the Dow is just one measure of our economic strength, and it largely indicates the health of our biggest corporations. It is certainly a positive sign that these companies are rebounding from the incredible blow dealt by the fiscal crisis. However, there are many other indicators that, together, enable us to analyze where our greatest weaknesses lie. Clearly, we need to address the issue of declining wages and increasing inequality. But we also need to consider the needs of small businesses and allow them to flourish and create jobs. As policymakers continue to grapple with how we get our economy growing again, small-business leaders, lenders and owners are coming together to encourage them to remember what works, what doesn’t work and to not cut off the fuel to the engine of economic growth they so love to praise. Economists are predicting that economic growth is on the rise this quarter, with the housing market doing better, hiring up, and increased consumer spending. Last week’s initial unemployment claims decreased by 22,000 from the previous week. For the past three months, employers have added 200,000 jobs per month— up from the average of 150,000 for the previous three months. While the economy isn’t growing at a stellar pace, these are at least some signs that it is inching forward. But even these small rays of hope will be eliminated if Congress does not make a deal on the sequester, or the $1.2 trillion in spending cuts over 10 years, slated to take effect starting midnight tonight. These will be across the board, impacting programs and services from the gamut of federal agencies. 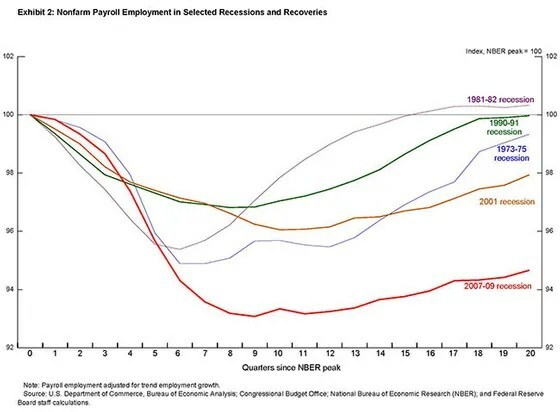 So while there are some signs of our economy slowly (very slowly) improving, the sequester could send us spiraling back into recession. In addition, there is a threat of the federal government shutting down at the end of March. As we’ve blogged about before, sequestration would have significant impacts on small businesses, particularly those that contract with federal agencies. CBS reports that 20 percent of defense contracts and 35 percent of defense sub-contracts are given to small businesses. Even though the sequester hasn’t taken effect yet, the uncertainty that small businesses have faced for months have let to layoffs and cutbacks. In total, two million jobs could be lost due to these budget cuts– and one million of those will be from small businesses. Loss of $5 million in primary and secondary education funding, which translates to 350 teacher and aid jobs at risk. 1,150 fewer work-study jobs for low-income college students. Loss of $83,000 in funding for job search assistance and placement, which translates to over 15,000 fewer people getting served. Loss of child care assistance for 1,300 disadvantaged and vulnerable children. Loss of over $1.5 million to provide meals to seniors. These are just some of the impacts that will be felt in North Carolina, in addition the national impacts that will affect everyone. The clock is ticking. Is small business lending in NC doing better than the nation? The Federal Deposit Insurance Corporation released data on bank statistics yesterday, showing a continuing trend of sluggish small business lending nationally. Inc.com reports that while commercial and industrial loans increased by 12 percent from 2011 to 2012, small business lending (here defined as loans under $1 million) only saw a meager 0.4 percent increase. In North Carolina, the FDIC data show that small business lending has not kept pace with commercial and industrial lending overall; however, it has seen a much bigger increase than the national average. Commercial and industrial loans issued by North Carolina banks increased 13 percent between 2011 and 2011, and loans under $1 million increased 5 percent. The data for very large banks (those with assets over $1 billion) mirror this trend. Despite the gap– small business lending is still lagging behind lending overall– this is significantly better than the national statistic. The question is, why? We continue to hear from our borrowers that accessing bank loans is still difficult, even for those who may have had bank loans in the recent past. More research would need to be done in order to figure out what is driving this data, however we have a couple of theories. First, bank consolidation has meant that the operations of the large banks have become more concentrated. North Carolina has seen a significant number of bank mergers, and several of the major national banks are headquartered here. The FDIC only measures loans made to U.S. addresses– it does not distinguish whether or not the loans made by NC banks are to addresses within the state. It could be, therefore, that while banks are issued from bank locations in NC, the loans are actually to borrowers elsewhere. Second, there is the question of who the banks are lending to. As we showed in our analysis of small business lending in NC, while large banks had a vast majority of lending resources, they were concentrating those resources on upper- and middle-income areas. We also had commented on a study by the National Bureau of Economic Research, which found that many more small businesses than originally though were accessing bank capital to finance their ventures. What the study also found, however, is that gender and race had an impact on a small business owner’s ability to secure outside capital. As already mentioned, more research would be needed to answer these questions. If North Carolina is, in fact, doing better than the nation, it is important to ask why and find out who is benefiting. Digging deeper into the data may reveal that while small business lending is increasing, those who have historically faced barriers to accessing capital continue to do so. FloridaToday.com ran a column yesterday by a local entrepreneur on the importance of child care to workers and small businesses. Rhonda Abrams, the president of a small business called The Planning Shop, which provides training and instruction for small businesses on developing business plans, strategies, and other topics related to entrepreneurship writes about the crisis of child care and the need for her workers– and the workers of other small businesses– to be able to access quality, affordable care for their children. Not only does this help out families, it also enables workers to stay at their jobs, reducing turnover and the loss of valuable employees. This is a particular challenge for female workers. Abrams cites that nationally, 64 percent of mothers with children younger than 6 years old are in the labor force. In North Carolina, median full-time earnings for women is $37,199, according to the American Community Survey. Child care costs in North Carolina, however, average between $6,000 for family care to almost $9,200 at a child care center, depending on the age of the child. This is a range of 16 percent to almost 25 percent of the median earnings. As child care costs continue to rise, parents struggle to be able to afford quality care– often having to use several different child care providers to cover a full-time work week. This is also a particularly acute problem for low-income families, for whom child care subsidies are the key to being able to find a job and stay in a job. But as WRAL reported recently, cuts to child care funding has meant that many families will lose their subsidies. In Wake County alone, a $1.9 million cut in funding meant that 750 termination notices were sent to families who were receiving child care assistance for kids between 81/2 to 12 years old. Small businesses all over the country lose terrific workers every day because of the lack of good child-care options, and some of the best and brightest women have dropped out of the workforce. Ultimately, helping parents care for their children while they work is an economic development issue. It affects workers, productivity, employee turnover, and job security. It also impacts the children who are not provided a stable and quality environment during their parents’ working hours. Economic development is not just about creating jobs or growing businesses; it is also about creating the supports to workers and businesses to help make them both viable. • The capital needed to start 40 million new businesses (average cost of $30,000). • More than enough to cover the payrolls for every small business in the country for six months (total $2.1 trillion annually). • Enough money for every small employer in the country to add five new $40,000-a-year employees for a full year (6 millionsmall employers). • More than the combined taxes to be paid this year by every filer under the IRS’s Small Business and Self-Employed division (about 40 percent of $2.9 trillion, or $1.16 trillion). • Triple the total amount of venture capital investments made so far this century ($423 billion since 2000). • The capital you would need to make 150,000 start-up investments, based on the average venture capital deal during that period ($8.1 million). • More than the total amount of lending to small businesses in the first half of 2012 ($1.17 trillion) and four decades worth of SBA-backed loans (about $30 billionannually). • The cost of covering the health insurance premium for every small business employee in the country for five months (average cost of $4,260 for individual coverage). • More than three times the total amount of goods and services exported by small and mid-sized businesses each year ($380 billion). • Enough money to power the SBA on its current budget for more than a thousand years (2013 budget request is $948 million). Of course, in reality, the entire $1.2 trillion– if saved– would not be devoted entirely to small businesses. Nevertheless, this is truly staggering and shows just how much money $1.2 trillion really is. Even saving a fraction of this funding would be significant for small businesses. For more details on the broader impacts of the sequester, see here for four charts that illustrate the impacts. Sadly, many in Congress are acting like the sequester is unavoidable. Rather than trying to stop it from happening– or even working toward a compromise– they’re working to protect their own districts. Seems like they’re missing the forest for the trees. Still, Congress has about a week to act. Let’s hope that our elected officials can save us from getting into another economic hole before then. The Small Business Administration’s Office of Advocacy released its state-by-state small business profiles for 2012. In North Carolina, it reports that the over 800,000 small businesses in the state account for 98 percent of all employers and employ almost half of the private sector workforce, or 1.5 million people. One important distinction to make is how ‘small business’ is defined. The SBA includes all businesses with fewer than 500 employees in its definition. This is a very wide definition, and the differences between the businesses on the small and large ends of the spectrum can be vast. Very small businesses– those with less than 20 employees– still make up the majority– 87 percent– of employer firms and 18 percent of employment. While the SBA-defined small business saw a net decrease in jobs by about 67,000, very small businesses saw a net increase of about 3,400. Considering the definition of small businesses is important in order to distinguish between the very different challenges and advantages of different types and sizes of businesses. We have previously blogged about groups or polls claiming to represent the viewpoint of small businesses when in reality “small” to them may mean something much larger and very different than the mom & pop, Main Street businesses that we work with. Such a wide category, with businesses employing from 1 to 500 people, really obscures the differences– and these data are often used to develop policy and set guidelines and regulations. It might be time for the SBA and other agencies that define ‘small business’ according to their own criteria to consider revising and coordinating their use of terms. It would help researchers, analysts, policy makers, and small businesses themselves if we had a consistent definitions. Clearly, small businesses of all sizes play a key role in employing people and creating jobs. For many communities, small businesses are the economic engines, creating jobs, providing wages, and generating wealth. With a better picture of each type of business, we can create even better policies and programs to support businesses of all sizes. Tonight, let’s declare that in the wealthiest nation on Earth, no one who works full-time should have to live in poverty, and raise the federal minimum wage to $9 an hour. This single step would raise the incomes of millions of working families. It could mean the difference between groceries or the food bank; rent or eviction; scraping by or finally getting ahead. For businesses across the country, it would mean customers with more money in their pockets. In fact, working folks shouldn’t have to wait year after year for the minimum wage to go up while CEO pay has never been higher. So here’s an idea that Gov. Romney and I actually agreed on last year: Let’s tie the minimum wage to the cost of living, so that it finally becomes a wage you can live on. Advocates for raising the minimum wage point out that it has not kept pace with inflation, and that it hardly provides workers a living wage. As the President said, those earning the minimum wage are still below the poverty level. Those against raising the minimum wage say that the cost to employers will be detrimental: their payroll costs will go up, they will stop hiring, they will lay off workers, and unemployment will spiral up. The real outcome of raising the federal minimum wage is much more complicated. It is true that the minimum wage has not kept up with the rising cost of living over the past few decades, which has significantly eroded its purchasing power. The tipped minimum wage– for workers such as waiters, servers, salon technicians, etc– has actually been frozen at $2.13 for the past 20 years. 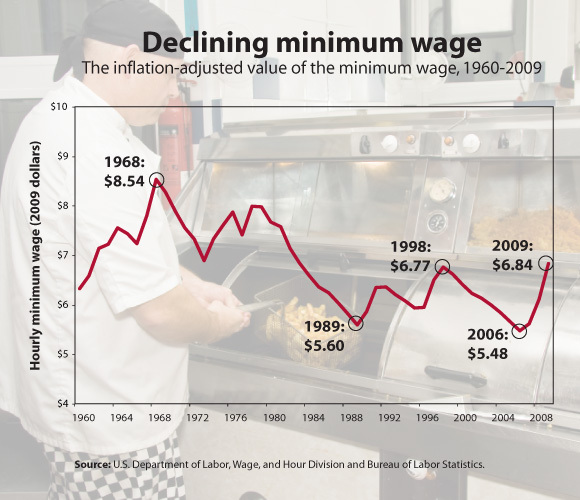 The chart below from the Economic Policy Institute shows that if adjusted for inflation, the value of the minimum wage has decreased over time. Raising the minimum wage would have some impact on employers, but recent research suggests that it would not have an impact on employment overall. Employers will respond to the minimum wage in a variety of ways that will have a variety of consequences– the linear connection between increasing the wage rate to firing workers isn’t linear, after all. Analyzing recent research on minimum wage increases, the Center for Economic and Policy Research found that while increasing the minimum wage had significant impacts on the wages of workers, the effect on employment is small. The economic recovery has been marked by a growth in low-wage jobs, in which some people and communities continue to struggle and lag behind. Growing income inequality was one factor that contributed to the severity of the Great Recession, and even though the recession is over, inequality persists and continues to grow. Increasing the minimum wage would help lift the floor for our lowest-paid workers, which would in turn strengthen the economy overall and benefit businesses of all sizes.